Tim Eyman is Washington’s most prolific sponsor of right wing ballot measures. He uses the Evergreen State’s initiative and referendum process to undermine representative democracy by forcing public votes on schemes purposely intended to wreck government. Eyman is one of many Grover Norquist clones trying to dismantle America’s common wealth at the state level. Eyman was born on December 22nd, 1965 in Yakima and was adopted there immediately after his birth. He studied business at Washington State University, graduating in 1988. He later moved to Mukilteo (where he currently lives with his wife and family) to start a business selling custom wristwatches to fraternities and sororities. The business was successful at first, but it collapsed when Eyman tried to expand too aggressively. He rebuilt it with the help of his wife. Eyman’s political involvement began in 1997, when he sponsored an initiative to the Legislature (I-200) to prohibit affirmative action in higher education and government hiring and contracting. He initially had difficulty collecting signatures for I-200, so he turned to his inspiration, California Grover Norquist clone Ward Connerly, for help. (Connerly sponsored the successful Proposition 209). Connerly suggested bringing in local conservative talk show host John Carlson. Carlson took over the campaign and qualified the initiative, which was ultimately approved by voters the next year (1998). After handing the I-200 campaign off to Carlson, Eyman started looking for some other scheme to turn into an initiative. Unable to think of an idea on his own, he looked around to see if there was something he could copy. He noticed that Republican Jim Gilmore of Virginia had successfully campaigned on a plan to slash vehicle fees in the 1997 gubernatorial election, and decided to use Gilmore’s proposal as the basis for his own initiative in Washington. His 1998 effort failed, but he came back in 1999 with what became Initiative 695. Eyman qualified Initiative 695 by capitalizing on the Legislature’s unwillingness to fix the broken motor vehicle excise tax (MVET) which many Washingtonians disliked. To this day, Initiative 695 remains the only initiative campaign he has run that relied on volunteers to collect signatures, rather than paid petitioners. (It takes less than half a million dollars to purchase a place on Washington’s ballot; anyone with money can successfully qualify any initiative they want, no matter what the idea or the degree of actual popular support for it). Despite opposition from a large and diverse coalition that included business, labor, and environmental groups concerned about the devastating impact to the state’s transportation system, voters passed Initiative 695. I-695 was challenged in court, and ultimately ruled unconstitutional, much to Eyman’s disgust. (There exists a striking picture of Eyman tearing up one of his I-695 campaign signs when the ruling was initially announced). The Legislature and then Governor Locke gutlessly decided to capitulate to Eyman and reinstate Initiative 695, thereby eliminating the statewide motor vehicle excise tax. They and locally elected leaders subsequently backfilled as much as they could to offset the damage, but I-695 left great scars that are still visible today, especially to communities that rely on Washington State Ferries. Eyman’s success with Initiative 695 endeared him to a number of wealthy conservatives, who put up the money for him to qualify Initiative 722 (an attempt to artificially limit property taxes) in 2000. The same year, Eyman turned to asphalt pavers for money to simultaneously qualify another scheme: Initiative 745. I-745 aimed to force WSDOT, Washington State’s Department of Transportation, to spend ninety percent of its funding on roads. Voters rejected I-745 and approved I-722; I-722 was soon torched by a legal challenge. During the campaign against I-747, Northwest Passage Consulting principal Christian Sinderman suspected that Eyman was not being truthful when he claimed that he was only a volunteer and was not paying himself out of his campaign treasury. As Eyman launched his next campaign, Initiative 776, the Seattle Post-Intelligencer’s Neil Modie wrote a story about Eyman’s suspicious money transfers (Eyman paid himself $165,000, Friday, February 1st, 2002). Forty eight hours after the Post-Intelligencer story ran, Eyman telephoned the Associated Press’ David Ammons (now the Communications Director for Secretary of State Kim Wyman) to admit what Sinderman had suspected all along, and what the Post-Intelligencer had charged: Eyman had been pocketing campaign funds for his own personal profit. He had in fact paid himself more than the governor of Washington State or any other elected official makes in a year. The following morning Eyman held an impromptu press conference at the Mukilteo post office, where he tearfully admitted in front of news cameras that he had lied. The story was a sensation. It led off the five o’clock news broadcasts on every major Seattle television station. It even made the New York Times. The disclosure surprised Eyman’s partners, Monte Benham of Kennewick, and Jack and Mike Fagan of Spokane, who announced at a news conference in the Secretary of State’s office that they were “benching” Eyman as “quarterback” of Permanent Offense and taking control of the campaign checkbook. Eyman turned his attention to fundraising for Initiative 776 and unusually began shunning the media spotlight. And he kept the hundreds of thousands of dollars he had pocketed for himself, even though Benham publicly urged him to return it. The aftermath of Eyman’s disclosure saw the founding of Permanent Defense, which to this day continues to oppose his initiatives. It also saw an investigation by the Public Disclosure Commission into Eyman’s finances. The PDC recommended in April of 2002 that Attorney General Chris Gregoire file a lawsuit against Eyman, which she did. (Eyman settled the lawsuit with the Attorney General that summer, paying a $50,000 fine and agreeing never again to serve as campaign treasurer). Eyman returned as Permanent Offense’s spokesman in July of 2002, as he and his cohorts turned in signatures for the measure. In the ensuing months Eyman proceeded to launch two more initiatives – Initiative 267 and Initiative 269, neither of which succeeded. The former, a second attempt to divert transportation funding to road building, was eventually abandoned; the latter, an effort to choke government spending in public services, never got off the ground. Initiative 776 narrowly passed in November of 2002. Despite its passage, and its later survival of a legal challenge, it did not succeed in destroying Sound Transit’s Central Link light rail project as Eyman had intended. Ground was broken on the project late the following year, and construction was finished six and half years later in mid 2009. Central Link opened to the public on July 18th, 2009 with strong ridership on its opening weekend. The project’s successful completion sealed a huge triumph for Permanent Defense and its fellow defenders of the common wealth over Tim Eyman. Following the November 2002 election, Eyman announced plans for his 2003 initiative (which later became I-807). He also disclosed he was launching a new political action committee with the Fagans, “Voters Want More Choices”, and parting ways with Monte Benham of Kennewick, who, unlike the other three, never had been interested in profiting from politics. “Never expected any, never asked for money, never wanted any,” Benham later told the Seattle Post-Intelligencer. 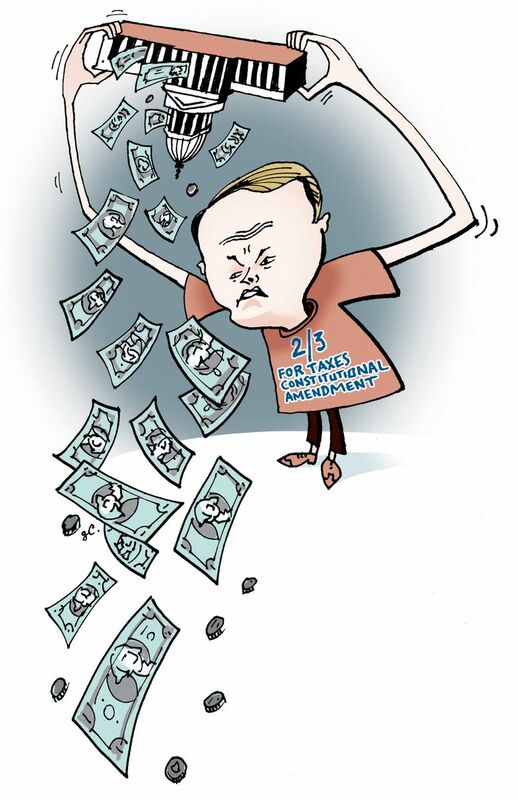 As 2003 progressed, Eyman faced a conundrum: He could not find the money to fund a signature drive for Initiative 807, a scheme to require supermajority votes for revenue increases. His previous mistakes and lies had finally caught up with his fundraising. Eyman turned his attention toward raising money for himself, ultimately setting up an unorthodox political committee, “Help Us Help Taxpayers” just for the purpose of raising money for himself and the Fagans. Permanent Defense ally Steve Zemke charged that Eyman was evading public disclosure rules, but the Public Disclosure Commission declined to discipline Eyman. The following year Eyman sponsored an initiative to slash property taxes (Initiative 864) which, like I-807, ran aground because Eyman couldn’t find the money to buy his way onto the ballot. In the spring of 2004, sensing that I-864 was in trouble, Eyman made a deal with casino owners, including the out of state Great Canadian Gaming, to sponsor an initiative that would legalize electronic slot machines (or video lottery terminals) everywhere across the state. Taxes collected on the slot machines would be used to offset property taxes. Thanks to the gambling industry’s money, Eyman qualified Initiative 892, but it was wildly unpopular: voters overwhelmingly rejected it that November. In August of 2004, a few months before voters rejected Initiative 892, Eyman finally found someone willing to put up money for his initiatives: Woodinville multimillionaire Michael Dunmire (October 4th, 1944 — March 29th, 2014), who made a fortune as an investment banker. Dunmire bankrolled Initiatives 900 (passed in November 2005), Initiative 917 (failed to qualify for the ballot), Initiative 960 (passed in November 2007) Initiative 985 (rejected in November 2008) and Initiative 1033 (rejected in November 2009). Dunmire also cosponsored Eyman’s 2010 measure, Initiative 1053, but the funding for that was largely provided by oil companies (BP, ConocoPhillips, Shell), Wall Street banks (JPMorgan Chase, Bank of America, Wells Fargo) and other large corporation recruited by the Association of Washington Business (AWB). To work around the limits of Dunmire’s generosity, Eyman repeatedly resorted to borrowing money against his home from USBank (another I-1053 donor) to fund initiative campaigns for I-985, I-1033, and I-1053. Dunmire also provided the money in early 2009 to repay the loans for I-985; he likewise provided the money in early 2010 to repay the loans for I-1033 . (In fact, he wrote a check directly to USBank on February 22nd, 2010, cancelling the entire I-1033 debt). The Association of Washington Business served again as Eyman’s bundler in 2012, raising more than a million dollars so Eyman could qualify I-1185 (a clone of I-1053 and I-960) to the November 2012 ballot. Unbeknownst to them, however, Eyman used some of their money to fund a second initiative (I-517) that would have made it easier and cheaper for him to qualify future initiatives to Washington’s ballot. This second initiative appeared on the November 2013 ballot after the Legislature took no action on it, where it was resoundingly defeated by voters. Prior to I-517’s demise, Eyman suffered another defeat when the Supreme Court ruled that the two-thirds vote requirement contained in I-960/I-1053/I-1185 was unconstitutional. The Court’s decision resulted in the restoration of majority rule to Washington’s statehouse. It didn’t take long for Eyman to start plotting his revenge. Washington’s Constitution requires amendments to originate in the Legislature and, fittingly, receive a two-thirds vote to be presented to the people for ratification at a general election. Lacking the power to introduce a constitutional amendment to reinstate the two-thirds vote requirement himself, Eyman sought to get his way through blackmail. He sought to qualify to the ballot an initiative to wipe out a staggering $8 billion in sales tax revenue over six years unless the Legislature agreed to pass his desired amendment by a certain date in 2015. But Eyman could not line up the money to qualify his revenge scheme to the 2014 ballot. Following the death of Michael Dunmire, he lined up two new wealthy benefactors (real estate developer Clyde Holland and hedge fund manager Kenneth Fisher) for a second attempt. With Fisher and Holland’s money, Eyman was able to qualify Initiative 1366 to the November 2015 ballot. Although only 19% of the state’s registered voters turned out in support of the measure, that was enough for it to pass in what became the worst turnout election in the history of Washington State. I-1366 was immediately challenged in court, and struck down as unconstitutional several weeks later by King County Superior Court Judge William Downing — a verdict unanimously upheld on appeal by the Washington State Supreme Court in May of 2016. Eyman did not make the 2016 ballot, having failed to persuade his benefactors to put up money for either a “Son of 1366” measure or an I-695-themed scheme to eviscerate vehicle fees. Instead, he spent much of the year grappling with the consequences of his violations of Washington State’s public disclosure law. About a month before ballots were mailed in October of 2015, the Public Disclosure Commission finally concluded a multiyear investigation into a complaint filed against Eyman during the summer of 2012, when Eyman was running a stealth signature drive for I-517 (his aforementioned self serving initiative on initiatives) with money provided by the business community for I-1185. PDC staff found multiple apparent violations of the law (including evidence that Eyman was receiving kickbacks from his signature gathering vendor) and urged the Public Disclosure Commission to refer the matter to the Attorney General’s office for further investigation, which it did. State attorneys proceeded to open an investigation, but their efforts to uncover the truth were stymied and thwarted at every turn by Eyman and his associates, who refused to cooperate. In June of 2016, fed up with Eyman’s stonewalling, the Attorney General went to court to get its civil orders enforced. Courts in Thurston and Snohomish counties ordered Eyman to turn over the documents the state had lawfully requested. When Eyman failed to comply, the Attorney General sought a contempt motion against him. At that point, Eyman’s attorney negotiated with the state to provide access to the documents it was seeking. The investigation resumed, and in March of 2017, Ferguson filed a lawsuit seeking penalties of more than $2 million and an injunction barring Eyman from directing or controlling finances for any political committee. Aside from qualifying initiatives to wipe out funding for the state’s public services, Eyman has also flirted with Washington’s religious right. In 2006, Eyman opportunistically sponsored Referendum 65 , an attempt to force a public vote on ESHB 2661 — the landmark legislation that outlawed discrimination on the basis of sexual orientation. Referendum 65 fell short of qualifying the ballot, much to the chagrin of right wing pastors, who had opposed passage of the law for decades. Following that experience, Eyman apparently made a decision to stay far away from social issues like LGBT rights. In early 2012, he vowed not to get involved in the political fight over marriage equality, calling it “a snake pit”. While most of Eyman’s initiatives over the years have been failures, he has enjoyed the occasional success; as mentioned earlier, two of his failed initiatives were even reinstated by the Legislature (I-695 and I-747) after they were declared unconstitutional by the State Supreme Court. Eyman has made a name for himself as a brash speaker; he talks quickly and stays on message relentlessly. He is a master of media manipulation, able to get the state’s newspapers, television stations, and radio stations to cover almost anything he does. His regularly and frequently emails reporters and political writers (all of his emails to supporters are copied to the press) and stops by their offices…. whether they want to hear from him or not. He seems to believe that he benefits from any publicity. All of the state’s major newspapers have printed his condensed ramblings on their op-ed pages repeatedly in the form of “guest columns”. Eyman has even succeeded in getting the same submission printed in several different newspapers at a time. To attract television cameras, Eyman has not hesitated to dress up in costume, notably donning a gorilla suit, Darth Vader getup, an orange prison outfit, and a Buzz Lightyear guise at different times. Eyman is also a voracious consumer of online media; he regularly leaves comments on newspaper blogs and in Internet forums, usually just repeating talking points from an earlier email sent out to his supporters. Eyman depends on access to large piles of cash in order to threaten the well being of Washington State with his incredibly destructive initiatives. Permanent Defense is committed to opposing each and every one of his ill conceived measures until he is out of business for good. Click on a thumbnail to see the cartoon where it was originally published in larger size.